I love to drool over beautiful art. I spent a few years in my mid twenties taking studio art classes, spending all my free time creating and daydreaming about being an artist. Though I do think I have some artistic talent, it turns out, that was not the direction my life was headed in. Maybe later in this life…or in another one. Who knows? But the importance of art in my life didn’t completely fade into the background because later in my teaching career when I was getting my Masters, I chose a program that focused on integrating the arts throughout the curriculum. It was a wonderful program and allowed me to keep the arts in the forefront of my teaching. Anyway, the point is, I’m still very drawn to the art world. It’s magical. A good piece of art can move my soul and make me feel alive and inspired. 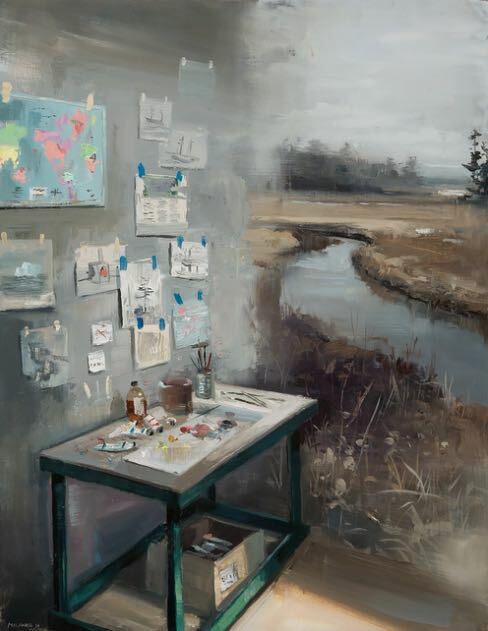 I recently ran across this piece by a New England artist, Jeremy Miranda titled Painting Table. To me it seemed to embody an aspect of homeschooling that I most value. It captures the idea of moving beyond the four walls of a classroom into our wide world to learn and explore. Sure it’s great to study maps or learn about the world through books, pictures, or videos, but nothing compares to stepping out and seeing it for yourself.